This guide is about Naples. Go here to read the Naples and Capri Guide. Naples is the yacht charter hub of southern Italy and the gateway to Capri and the Amalfi Coast. The Isle of Capri and Amalfi present some of the most spectacular coastlines of the whole Mediterranean. Naples is an inspired old city port and is one of the very oldest yachting holiday destinations in all of Italy. Interestingly, it is also famous for being the place where pizza was born. Of course, the pizza is not the only reason why Naples became popular among superyachts and luxury yacht charterers. There is a large port here and also a luxury yacht marina and this Italian city is a common charter pick up and drop off point with its international airport allowing easy travel access. Known to the locals as Napolis, this Italian city is also renowned for its ancient beauty and idyllic charm. Naples is the capital city of the region of Campania and is the biggest in terms of land area in the whole of the southern region of Italy. Easily the best place in the region when it comes to the thrill and excitement. Nothing comes close to the experience of staying in a charming place along the enchanting Bay of Naples and the imposing outline of Mount Vesuvius serving as backdrop. There are a lot of reasons why seasoned sailors and tourists who spend their holiday in Italy on board luxury will fall under spell of Naples, acclaimed as one of western world’s most prosperous and oldest cities. The city’s endless stream of marvels is simply amazing – a thriving hub for the arts, exquisite gastronomic treats, rich Italian culture, booming tourism, and a lot, lot more. This means that there are a lot of things that you will love about Naples, not just for the stereotypes such as Neapolitan music and the ubiquitous pizza. This popular yacht charter holiday destination, being located on a volcanic region, boasts of other unique attractions such as places where there are volcanic mud and hot springs. These are important places in Naples that are frequently visited by holidaymakers who want to experience the therapeutic effects of these volcanic creations. Of course, you simply cannot afford to miss the stunning Solfatara as it spews jets of water and gas several metres up into the air. Naples also boasts of a rich history. Its glorious past is evident in several spectacular monuments and important landmarks. These ageless masterpieces show the strong influence of the Romans, and it is definitely one of the best places to visit if you want to sample the best of ancient Mediterranean civilization. 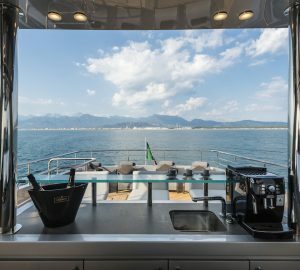 Aside from these magnificent splendours in Naples, yacht charter enthusiasts also come to this idyllic place to enjoy things that are close their hearts – fine Italian cuisine and Italian wines as well as the other exhilarating panoramas and views. Sailing through the Gulf of Naples on board your charter yacht will be like journeying back to time where Nobles, Lords and Emperors reigned supreme in this region. This is the best way by which you can experience and enjoy the full majesty and magnificence of the Old Naples. The warm and friendly climate through most parts of the year makes Naples the best destination for a lot of sailors and yacht charter aficionados. Indeed, your Italian jaunt will never be complete without an immersion to all the wonders and grandeurs of Naples. You have to include this idyllic tourist spot if you really want to experience an authentic Italian yacht charter holiday. More info on Naples and Capri yacht charters on the Amalfi Coast. The sprawling city of Naples is one of the oldest settlements in the world and as it covers the whole of the bay, there is a wealth of history and culture to uncover on a luxury yacht charter in Italy. Savour the flavours of Italy and taste pizza made in its originating city, then cool off on a hot afternoon with a choice selection of handmade ice creams at the gelattos dotting the streets. There is no end of choice for an entertaining evening and the city has everything from exclusive clubs to elegant bars and restaurants for an authentic experience of Italian life before you return to port to continue the party with family and friends on your lavish superyacht sundeck. Beaches are easy to come by in the region, with winding inlets surrounding Sorrento to the south such as Baia delle Sirene, and kilometres of sand along the coast all the way up to Gaeta. Baia Trentaremi is a secretive spot not far from the city where guests can spend the afternoon sunbathing on the beach, fishing and playing on the water toys. Castellammare Di Stabia and Spiaggia Delle Mortelle are close to the Naples marinas should your group want to spend the day in port, indulging in high-end shopping and sightseeing. If you also want to include Pompeii in your tour, be sure to visit The National Museum of Archaeology where some of the ruin's best finds are kept for preservation. The area has a variety of dive sites that include caves and wrecks that will challenge more experienced Scuba divers and add to the satisfaction of a trip to the Amalfi Coast. The clear water is ideal for young swimmers, snorkelers and guests learning new water toys such as Jet skis and Seabobs. Marina facilities are well developed and abundant with the nearby shipyard Cantieri di Baia, and stretch north from the Port of Naples to include Coppola Pinnetamare and Castel Volturno to the northwest and Torre Annunziata and Castella Mare anchorage to the south. Superyacht charter groups exploring the Amalfi Coast are ideally positioned to take in a number of the region's attractions including the picturesque island of Ischia, where volcanic activity has created plenty of spas offering hot springs and volcanic mud treatments. The warmest time to visit Naples is from May until October when temperatures average between 18-25°C/64-77°F. May-August are the driest months to visit while April showers worth factoring in as well as a wet season running from October until the New Year. Sea temperatures rise in April and remain steady around 25°C/77°F until November. Naples is the yacht charter hub of southern Italy and the gateway to Capri and the Amalfi Coast. In close proximity to Naples are a number of exciting sailing destination.